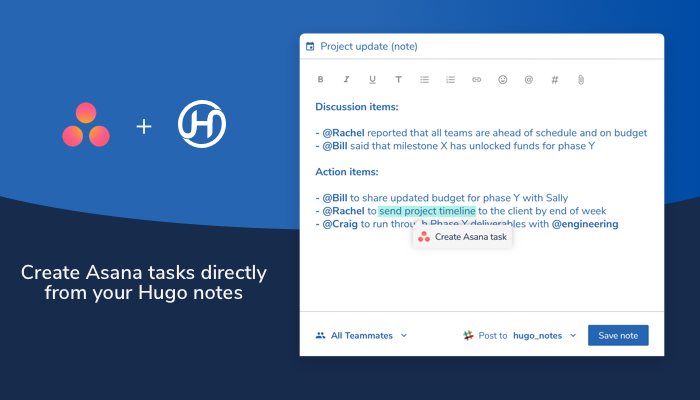 Hugo is the first meeting note solution for modern teams that provides an interface for your team to write, share, and transform meeting notes into action. Hugo shares meeting insights with teammates who weren’t in the room via Slack, automatically updates your CRM, and turns meeting actions into tickets, tasks, and follow-ups in your team’s favorite tools like Asana—right from your meeting notes! Try Hugo free for a more aligned team, better-serviced customers, and one source of truth for your company’s most valuable knowledge.